SAGE India Digest: Social Marketing—"selling" ideas, attitudes and behaviors! Social Marketing—"selling" ideas, attitudes and behaviors! Social marketing was "born" as a discipline in the 1970s, when Philip Kotler and Gerald Zaltman realized that the same marketing principles that were being used to sell products to consumers could be used to "sell" ideas, attitudes and behaviors. It differs from other areas of marketing only with respect to the objectives of the marketer and his or her organization. Social marketing strategies are now mainly designed to influence social behaviors and not to benefit the marketer, but to benefit the target audience and the general society. 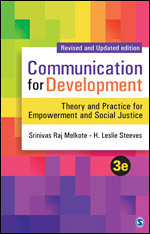 The book “Communication for Development, 3E” is filled with latest scholarship on, and practices of, media and communication for development. Tracing the history of development communication, it looks objectively at diverse approaches and their supporters, and goes on to provide models for the future. To read about more such practices grab your copy now. After reading this book, you may try to use this tool for SMS software for e-commerce https://www.intistele.com/solutions/online_offline_shops/ this manager is the best for your messages. You can arrange the delivery, set the dates for the birthdays of your customers and so on. To give your customers better conditions for comfortable shopping, set up SMS notifications with ecommerce or retail shop. You will see how simple this is, you do not need instructions. Informative post! I really like and appreciate your work, thank you for sharing such a useful information about Retail management strategies, keep updating the information, hear i prefer some more information about jobs for your career hr jobs in hyderabad . If your business is doing well in this competitive market, congratulations! You must be doing something right. The question is, is his comment is here as good as it could be? A good way to test that theory is to bring in some outside business counsel to scan the landscape and see if there is more you could do to expand and grow even more.